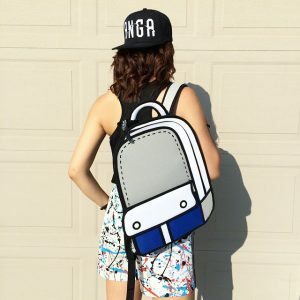 It’s 2015 and 2D Bags has a new cartoon backpack for you! 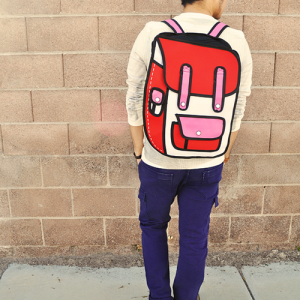 Grab this eye popping 2D Backpack for your back to school supplies while it’s on SALE! It’s Red, it’s blue, and it’s big! 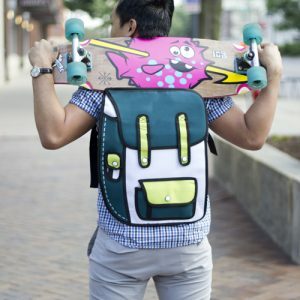 One of the newest 2015 Cartoon Backpacks for this back to school season sports a bold appearance that is perfect for contrasting with your everyday environment. When you walk up to your school, you’ll be bombarded with compliments and remarks about your 2D Bag. Be prepared to be asked where you got it from cause someone is going to be envious! Designed by college students, for college students you can rest assured this bag is suited for college needs and will definitely work for high school and elementary. Grab it today while the SALE lasts! 1. Made of outer water resistant canvas material. 2. Enjoy an extra large primary zippered compartment great for fitting big ticket items such as college textbooks, laptops, game consoles, clothes, you name it! 3. If that wasn’t enough space, enjoy another large secondary compartment which can also fit large ticket items more snug such as a smaller laptop, tablets, books, spare clothes, makeup, and more! 4. Inner textiles are made of polyester, nylon, and plastic. 5. Adjustable straps for correct fitting. 6. Large top handle to lug your cartoon backpack around easily. 7. Super small buttoned compartment for chap stick or other similarly small items.